To listen to Srimad Bhagvata Katha itself is a great fortune and that too, from the lips of H. H. Sri Swami Adhyatmanandaji Maharaj. It is indeed spiritual feast for a blessed soul. It was a divine thought of members of late Sri Shivprasad Baxi family of Jamnagar to have Srimad Bhagvata katha in the loving memory of their ancestors. Dr. Arun Baxi, a Retired Vice Chancellor of Gujarat Ayurvedic University was instrumental in organizing this holy event at the Ashram. 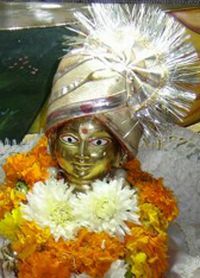 Holy Sri Bhagavat Saptah began with a colorful procession, called Shobha Yatra on Nov 12, 2006. It started with blowing of the conch, drums and musical by temple orchestra group in the front , colorful young girls (Kanyas) with kumbham, filled with holy water on the head walking the next, Sri Lalaji (cute little Baby Krishna) having fun ride on a decorated elephant in the middle and hundreds of devotees rejoicing and dancing in the back.It was a divine sight to see and would instantly elevate a person in a different realm from mundane life chores. The procession started from Lord Vishvanath temple and led to Sri Ashtlaxmi Bhavan. It was an unforgettable experience for all. Mahamandaleshwar H. H. Sri Swami Nityanandaji Maharaj, (disciple of Brahmlin H. H.Sri Swami Muktanandaji Maharaj of Ganeshpuri, Mumbai) and Worshipful H. H. Guruvarya Sri Jashbhai Sahib of Anupam Mission graciously lit the lamp and blessed the occasion. 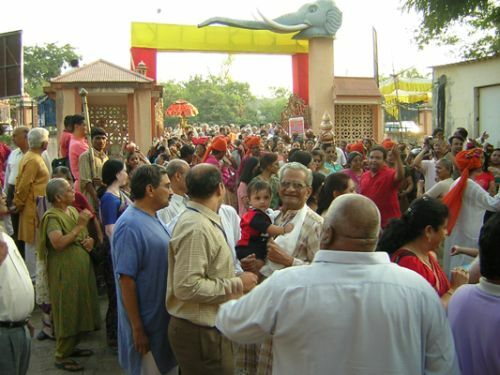 Large numbers of devotees attended to the overflowing capacity of large Ashtalaxmi Bhavan. Concluding of Katha brought a feeling of joy and inner satisfaction to devotees as well as the organizers, the Baxi family. A grand MahaPrasad (Bhandara)) was served to all at concluding (purnahuti) of Srimad Bhagavad Katha. During the week of Bhagvata saptah, week two simultaneous activities were organized at the ashram, as part of Dr. Sivananda Adhwaryoo Centenary celebration. Morning Yoga Pranayama & Meditation session from 6.00am to 7.30 am by Sri Swami Adhyatmanandaji and Medical camp ( 7.30am to- 8.30 am) by a team of doctors, who provided free consultation to patient suffering from variety of medical problems like heart condition, Asthma, Diabetes and many more. Dr. Arun Baxi Retd. Vice Chancellor of Gujarat Ayurvedic University, Dr. Snehal Amin (General Physician), Dr. Mayur Patel (Diabatologist), Dr. Swetang Pancholi (Cardiologist), Dr. Mrs. Ina Patel (Pathologist) and Mrs. Chidrupini Kshatriya (Dietician) provided their valuable time and expert knowledge in the respective fields. About three hundred and fifty patients received proper medical care and needed instructions for their illness. In addition, prevention of many diseases by regular practice of simple Yoga, pranamyam and mediation was emphasized by Swami Adhyatmanandji during the morning yoga sessions. Jal neti and Kunjal kriya (cleansing of nasal passage and stomach) were demonstrated and taught to interested people by Ms. Sangeeta Thawani and other Yoga instructors of the ashram. The medical camp was extended up to Nov 30, 2006. 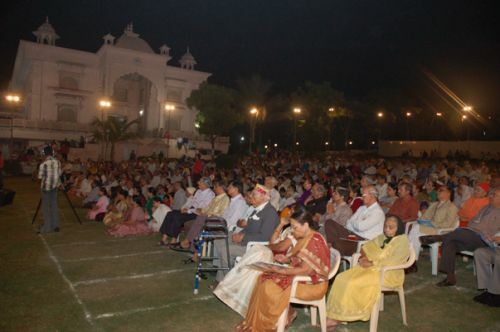 The evenings (8.30pm-10.00pm) , during the week of Bhagavat Saptah, were colorful festival and feast at the ashram lawn. 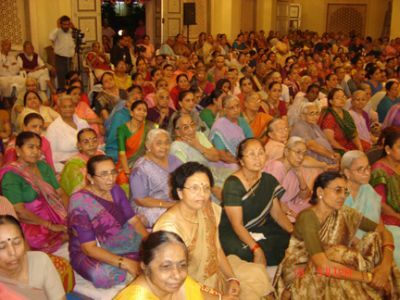 Large numbers of people rejoiced the devotional music singing by different artist groups each day from in and around Ahmedabad. Among them were Shri Shekhar Sen (Mumbai), Smt. Monika Shah (Surmani), Smt. 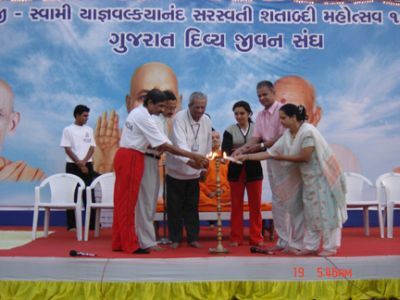 Bansuri Bhatt, Shri Shyamal & Shri Saumil Munshi, Shri Nayan Pancholi, Shri Ram Kumar, Smt. Mayurika Oza, Ms. Shraddha Shah and Shri Ghanshyamdan Gadhavi poured divine music and enchanted the people’s hearts. 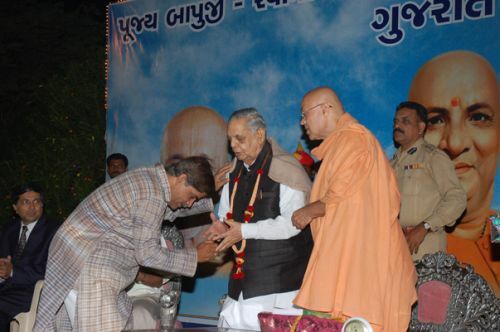 These warm feelings were being expressed by H. E Pundit Naval Kishor Sharmaji, Governor of Gujarat at a function organized in the honor of “Revered Bapuji”, H.H. 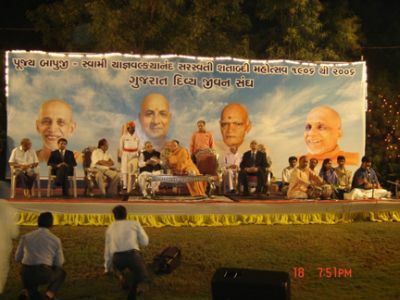 Sri Swami Yagnyavalkyanandaji Maharaj’s Centenary Year celebration on November 18, 2006 at Sivananda Ashram, Ahmedabad. On Nov 18, 2006 was a special evening (8.15 pm - 9.10pm). “Rev. 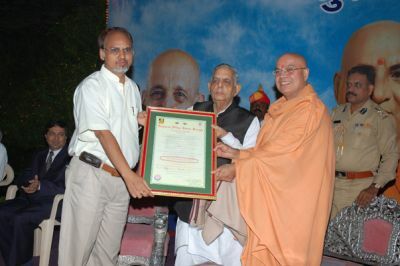 Bapuji”, Dr. Swami Yagnavalkyananda Saraswati’s birth centenary celebration. H. E Governor of Gujarat Pandit Naval Kishor Sharmaji visit brought a special fervor. The evening started with a devotional singing by Pundit Shree Niraj Chandra Parikh. Number of eye surgeons and specialists were honored on this occasion. Among them was Dr. C.L. Verma, C.M.O. Sivananda hospital, Virnagar, Dr. R.R. Doshi (91 years age) Chikhodara - Anand, Dr. Bharat Ghodadara C.M.O department Opthalmology Civil Hospital (Ahmedabad), Dr. Abhay Vasavada (Ahmedabad), Dr. Piyush Matalia and Dr. Bharat Bakshi Jamnagar, Dr. Ashok Shroff (Navasari) by H. E. Governor of Gujarat for their meritorious services to the poor, needy and downtrodden. Release of fourth edition book "Maan"
Dr. C. L. Verma, C.M.O Sivananda hospital, Virnagar gave a heart touching speech in praise of “Beloved Bapuji”, Brahmlin Sri Swami Yagnyavalkyanandaji that Dr. Adhwaryooji was God’s special creation. He was a miracle by himself. He was a perfect eye surgeon as well as a general gynecologist. He kept on operating all types of eye operations and general surgical work as well as gynecological work up until the very last days of his sojourn on the earth. He was a wonderful soul, ecologist, philanthropist, and a devotee of the Lord to the core of his heart. He was a loyal and dedicated disciple of his divine Master Gurudev H. H. Sri Swami Sivanandaji Maharaj. He started schools and hostels for boys and girls, free kitchen for patients and their relatives, prayer halls and what not. 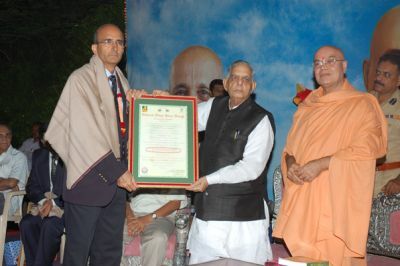 Sri Rajendrabahi Bhatt, a trustee of Sivananda Mission, Virnagar and convener of Dr. Sivananda Adhwaryoo birth centenary celebration briefed the activities planned as a part of the celebration. As a part of Centenary Celebration free eye check up and essential eye care to underprivileged, tribal and school children on mega-scale has been planned, as the selfless services were very dear to Pujya Bapuji. From December 2006 to February 2007, a team of ophthalmologists with paramedical staff will be going to Municipal schools of the city and provide eye checkup which include a eye related tests and surgical treatment as necessary. The project has already been started and about 15000 children are estimated to get benefited. Also many other activities including distribution of spiritual literatures have been planned. 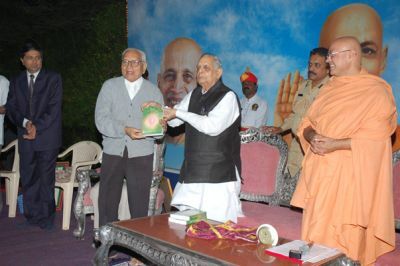 Release of Gujarati version of “Srimad Bhagawad Gita" of H. H. Sri Gurudev Swami Sivanandaji Maharaj by H. H. Sri Swami Satyamitranandaji Maharaj. It is available for a special promotional rate of Rs.100.00 up to the end of this year. Special Coverage honoring "Pujya Bapuji" will be in December 2006 issue of “Divya Jivan” a monthly Journal. Special spiritual literature of 25 different tittles will be available up to 50% discounted rate. Sri Arun Oza, trustee and vice president of Sivananda Ashram, welcomed H. E. Governor and mammoth gathering on this occasion. Sri Swami Adhyatmanandaji elaborately brought the spotlight upon the life and divine mission of Sri Swami Yagnyavakanandaji Maharaj. Sri Arvind Mehta, treasurer of Gujarat Divya Jivan Sangh gave vote of thanks. All trustees of Gujarat Divya Jivan Sangh and many leading medical practitioners from Ahmedabad and near by cities attended the function. The program concluded with prayer for the peace. Guru Nanak’s Jayanti was celebrated with great devotion at Gurudwara. 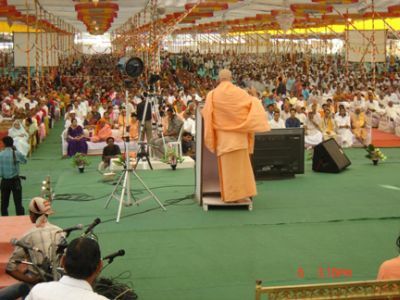 H. H. Sri Swami Adhyatmanandaji Maharaj and group of devotees from the ashram attended a large gathering on this occasion. Swamiji shared his thoughts on holy Sri Guru Granth Sahib and the teachings of Guru Nanakdev and enlightened the devotees. 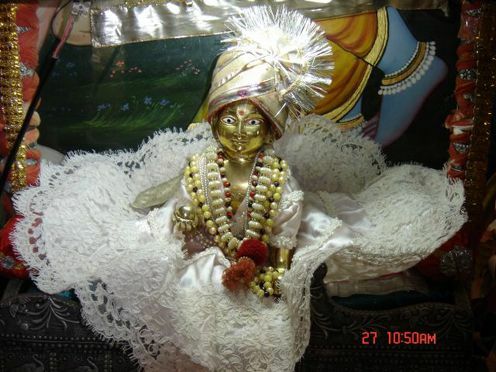 He spoke in Punjabi language that made all the devotees happy. Rev Swamiji joined the devotees in making rotis in the kitchen as he believes in “Kirat Karo Te, Vand Chhakhho”. He par took the prasad in Langar with devotees. Home minister Mr.Nitin Shah was present on this occasion. On the same day Anjumane Islam and youth community of Muslim league, invited Sri Swamiji to address religious gathering organized on Id e Milad celebration at Town Hall of Municipal Corporation. 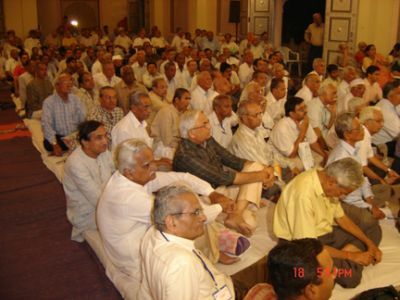 Shree Krishna Pranami sect of famous Khijada Mandir of Jamnagar organized a grand religious program for twelve days celebrating founder’s 350th birthday, which concluded on Nov 6, 2006. 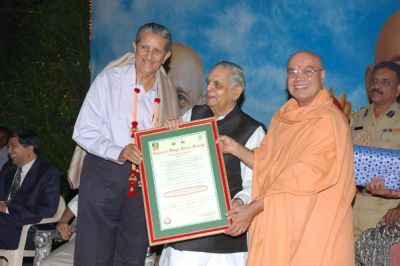 Sri Swami Adhyatmanandaji Maharaj was invited among many other saints and dignitaries from all over India, including H. E. Governor of Gujarat and the Chief Minister of Gujarat. Sri Swamiji in his thundering address thrilled the audience. Over one and a half lakhs devotees assembled at this memorable event. Wide media publicity was given to this grand religious gathering. Astha television Channel broadcasted live coverage. Sri Swami Adhyatmanandaji went to a flying visit to Chandigarh, Panchkula and Delhi. At Panchkula, late Sri Dr. Akshayji Gupta’s family performed Gayatri Yagna in the loving memory of their Father’s first death anniversary in holy presence of Rev. Swamiji Maharaj. 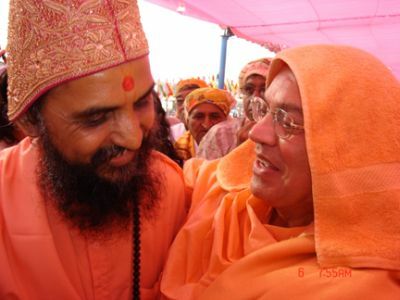 Swamiji attended two public meetings arranged by group of Lawyers at Bar associations on Nov 21, 2006 and Nov 22, 2006. Swamiji spoke on the subject of cultivating the love, harmony and mutual understanding to avoid the matrimonial problems. At Delhi Sri Swamiji Maharaj visited number of sick senior citizens and devotees of Rev. 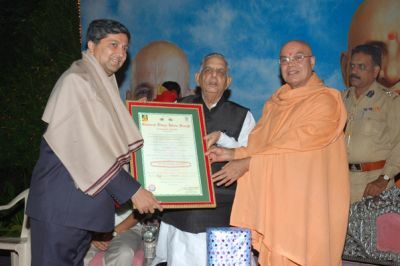 Guru Bhagawan Sri Swami Sivanandaji Maharaj. Rashtriya Sevika Samittee held five days seminar from Oct 27, 2006 to Oct 31, 2006 at the Ashram, which concluded on Nov 1, 2006. 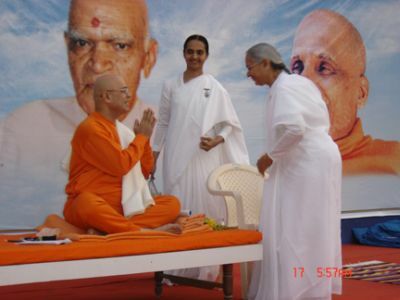 At concluding ceremony, all were happy to receive Sri Swamiji’s blessings. On Nov 23, Swamiji attended condolence meeting held by Sri Kunj Bihari Daveji, who lost his father Sri Vasudevbhai Dave (96 year old). He had a great love and special regard for Sri Swami Adhyatmanandaji Maharaj. He was very dear grandfather of Res. 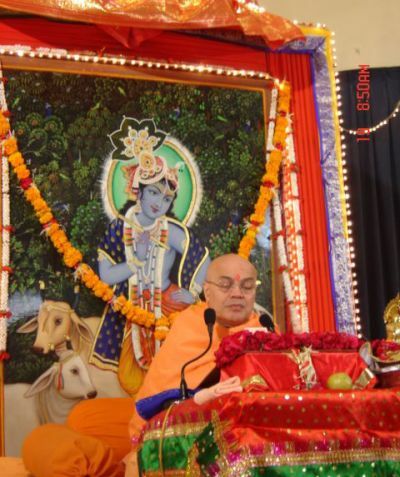 Sri Kamlesh Dave, host of Swamiji at Toronto Canada. Swamiji offered a prayer for the peace of the departed soul. On Nov 24, Sri Swamiji went to Baroda and inaugurated extension of management consultant office of Mr. Kishore Swadia , Trustee of Gujarat Divya Jivan Sangh. 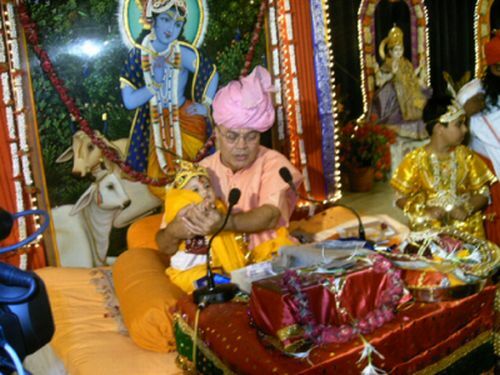 A sacred Yajna was performed in Swamiji’s holy presence. Rev. Swamiji’s words of wisdoms on ethics of “Time Management and Work Management “received a great appreciation by people attended this function. Yoga Teacher Training Course (YTTC) at Sivananda Ashram, Ahmedabad is organized under the guidance and leadership of Yogacharya H. H .Swami Adhyatmanandaji, who has been teaching Yoga over thirty years and has conducted over 680 Yogasana Camps over the globe. Swamiji is beloved disciple of H. H. Sri Swami Chidanandaji Maharaj, present President of a great institute, Divine Life Society founded by a Holy Master H. H. Sri Swami Sivanandji Maharaj. 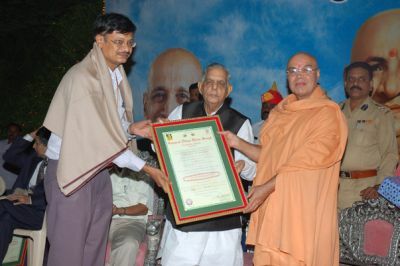 Swamiji was initiated in the Holy order of Sanyasa in the year 1974. Ever since then, as per his worshipful Gurudev's instructions he is continuously spreading the message of sages of the yore and sharing the knowledge of ancient cultural and scientific heritage of ancient India through Yoga, Pranayama, and Meditation. YTTC will provide you a wonderful opportunity to further develop your skill in the science of Yoga and expand your abilities to teach yoga to others. You will be learning from a Master. Ashram’s holy atmosphere is ideal for enhancing your spiritual growth as well as the skill in the field of science of Yoga.